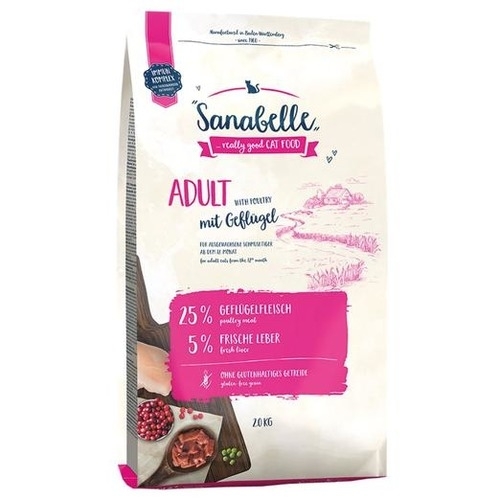 Sanabelle Adult+ Poultry delivers high quality protein packed in the gluten-free kibble with great taste. Rich in natural chondroitin and glucosamine to support and maintain bone cartilage. 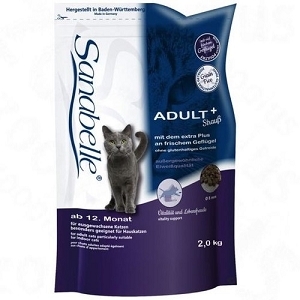 Adult Sana Belle is a wholesome and tasty food for on-demand full-fledged cat food, preferably of cats, most of which live in the house (INDOOR). 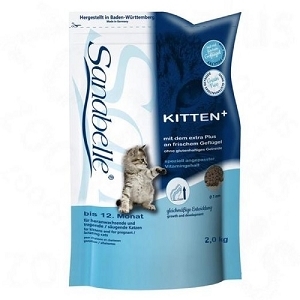 The balanced amounts of minerals, trace elements and vitamins are a basis for the vitality and joy of life and support the natural defences of your cat. 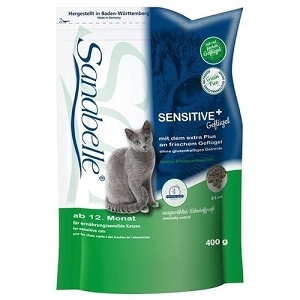 for adult cats particularly suitable for house cats. Sana Belle Adult characterized by balanced nutrient levels and balanced levels of minerals, trace elements and vitamins. Vitality and joy of life will be enhanced and the natural defences strengthened your cat. Poultry meat meal, corn, barley, animal fat, liver meal, fish meal, Fleischhydrolysat, greaves (dried), cellulose fibre, meat flour, whole (dried), dried beet pulp, linseed, yeast (dried), fish oil, potassium chloride, cranberries (dried), blueberries (dried) , Shellfish meat meal, Chicoreepulver, marigold blossom (dried), yucca extract.